1. Make the watermelon barbecue sauce. Add the watermelon, ketchup, honey, chipotle peppers and salt to your blender. Blend on high until smooth. 2. Marinate the chicken. Add the chicken to a large re-sealable bag. Pour the marinade over the chicken. 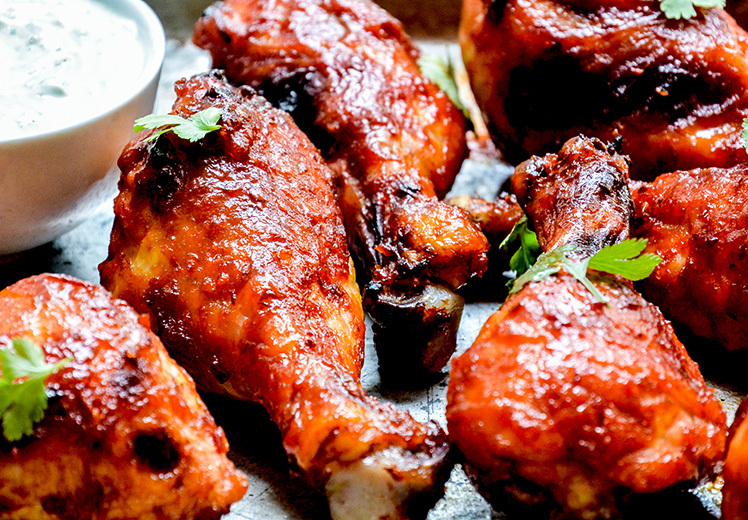 Transfer the chicken to your refrigerator and let it marinate for 1-2 hours. Give the bag a shake once or twice during this time to make sure all the chicken is coated. 3. Meanwhile, make the blue cheese dipping sauce. Add all of the ingredients to the bowl of your food processor with the blade attachment. Process until well combined. Transfer the dipping sauce to a small bowl and refrigerate it until you’re ready to use it. 4. Pre-heat your oven to 425 degrees. Line two baking sheets with aluminum foil and place wire racks on top of the foil. Remove the chicken from the marinade and place on the wire racks, making sure the pieces are about 1-inch apart. Transfer to your pre-heated oven and bake for 40-45 minutes, flipping the chicken drumsticks over with a pair of tongs once half way through baking. 5. Meanwhile, bring about 1 cup of the marinade to a boil in a small saucepan. Then turn down the heat to maintain a simmer and cook for about 10 minutes, stirring frequently. Remove from the heat and set aside. 6. After the chicken has finished baking, remove it from the oven and pre-heat your broiler. Brush the chicken with the cooked marinade. Place the chicken under your broiler for 1-2 minutes, or until the marinade bubbles and has started to darken in some places. Remove the chicken from the oven.